As many of you know I teach every Monday a stamping class at the senior center in Lecanto. The class is three dollars and is open to anyone. I'm able to have ten and presently there are eight regular attendees. Sign up is required a week before so I can prepare additional packets for use. The above photo is what everyone will be making on Monday. The paper clip in the right hand corner is a holiday bookmark. 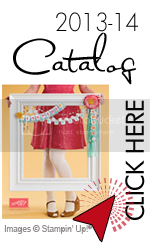 This is a cute gift idea for adults or children. The paperclips can be purchased at Walmart. 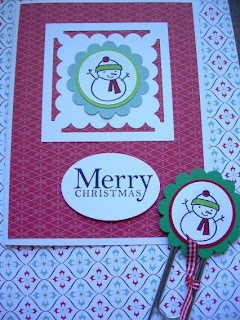 I'm sure many of you are wondering on how I created the white scalloped paper under the snowman. This is very simple if you have the new Stampin'Up scallop punch. Just cut a piece of paper 23/4 inch square. Place the paper centered in the punch and punch each side one time. The background paper is from the Ski Slope Designer Series paper found in the holiday mini.